Penguin Books is a British publishing house. It was founded in 1935 by Sir Allen Lane as a line of the publishers The Bodley Head, only becoming a separate company the following year. Penguin revolutionised publishing in the 1930s through its inexpensive paperbacks, sold through Woolworths and other high street stores for sixpence, bringing high-quality paperback fiction and non-fiction to the mass market. Penguin's success demonstrated that large audiences existed for serious books. Penguin also had a significant impact on public debate in Britain, through its books on British culture, politics, the arts, and science. Penguin Books is now an imprint of the worldwide Penguin Random House, an emerging conglomerate which was formed in 2013 by the merger of the two publishers. Formerly, Penguin Group was wholly owned by Pearson PLC, the global media company which also owned the Financial Times, but it now retains only a minority holding of 47% of the stock against Random House owner Bertelsmann which controls the majority stake. It is one of the largest English-language publishers, formerly known as the "Big Six", now the "Big Five". The Second World War saw the company established as a national institution, and though it had no formal role, Penguin was integral to the war effort thanks in no small part to the publication of such bestselling manuals as Keeping Poultry and Rabbits on Scraps and Aircraft Recognition and supplying books for the services and British POWs. Penguin printed some 600 titles and started nineteen new series in the six years of the war and a time of enormous increase in the demand for books, consequently Penguin enjoyed a privileged place among its peers. 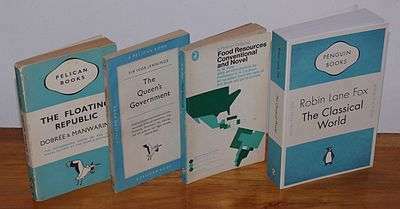 Paper rationing was the besetting problem of publishers during wartime, with the fall of France cutting off supply of esparto grass, one of the constituents of the pulp Penguin used. As such when rationing was introduced in March 1940 a quota was allocated by the Ministry of Supply to each publisher as a percentage of the amount used by that firm between August 1938 and August 1939. This was particularly advantageous to Penguin who as a volume printer had enjoyed a very successful year that year. Further in a deal with the Canadian Government, Penguin had agreed to exclusively publish editions for their armed forces for which they were paid in tons of paper. By January 1942 the Book Production War Economy Agreement regulations came into force which determined rules on paper quality, type size and margins, consequently Penguin eliminated dust jackets, trimmed margins and replaced sewn bindings with metal staples. Aside from the noticeable deterioration in the appearance of paperbacks it became a practical impossibility to publish books of more than 256 pages resulting in some titles falling out of print for want of material. In addition to their paper allocation Penguin secured a deal in late 1941, through Bill William's connections with ABCA and CEMA, with the War Office to supply the troops with books through what would be known as the Forces Book Club. Penguin would receive 60 tons a month from Paper Supply in return for 10 titles a month in runs of 75,000 at 5d. Previously every paperback carried the message "FOR THE FORCES Leave this book at a Post Office when you have read it, so that men and women in the Services may enjoy it too" at the bottom of the back cover inviting the reader to take advantage of the free transmission of books to the forces by the Post Office. However demand was exceeding supply on the home front leading Lane to seek a monopoly on army books made specifically for overseas distribution. This dominance over the paper supply put Penguin in an especially strong position after the war as rationing continued. Many of its competitors were forced to concede paperback reprint rights to Penguin for this reason as well as the popular prestige the company enjoyed. In 1945, Penguin began what would become one of its most important branches, the Penguin Classics, with a translation of Homer's Odyssey by E. V. Rieu. Between 1947 and 1949, the German typographer Jan Tschichold redesigned 500 Penguin books, and left Penguin with a set of influential rules of design principles brought together as the Penguin Composition Rules, a four-page booklet of typographic instructions for editors and compositors. Tschichold's work included the woodcut illustrated covers of the classics series (also known as the medallion series), and with Hans Schmoller, his eventual successor at Penguin, the vertical grid covers that became the standard for Penguin fiction throughout the 1950s. By this time the paperback industry in the UK had begun to grow, and Penguin found itself in competition with then fledgeling Pan Books. Many other series were published such as the Buildings of England, the Pelican History of Art and Penguin Education. In 1986, Penguin purchased American publisher New American Library and its hard-cover affiliate E.P. Dutton. New American Library had originally been Penguin U.S.A and had been spun off in 1948 because of the high complexity of import and export regulations. In 1986--Penguin repurchased NAL (New American Library) in order to extend its reach into the US market, and NAL saw the move as a way to gain a hold in International markets. The text page design was also overhauled to follow a more closely prescribed template, allowing for faster copyediting and typesetting, but reducing the options for individual design variations suggested by a text's structure or historical context (for example, in the choice of text typeface). 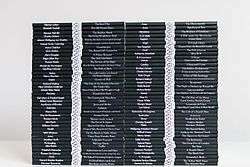 Prior to 2002, the text page typography of each book in the Classics series had been overseen by a team of in-house designers; this department was drastically reduced in 2003 as part of the production costs. The in-house text design department still exists, albeit much smaller than formerly, and is managed by text designers, Claire Mason and Lisa Simmonds who oversee the majority of the design work. Recent design work includes the Penguin Little Black Classic series. In 1965 Penguin entered the field of educational publishing, Allen Lane’s aim being to carry the radical and populist spirit of Pelicans into the schoolbook market. His final major initiative, the division was established as a separate publishing operation from Harmondsworth, and based in West Drayton in Middlesex. During its nine-year life it had a major impact on school books, breaking new ground in their concept and design and strongly influencing other publishers’ lists. Among the most successful and influential series were Voices and Junior Voices, Connexions, and the Penguin English Project. Alongside these and other series, the imprint continued another Penguin tradition by producing Education Specials, titles which focussed on often controversial topics within education and beyond. They included highly topical books such as The Hornsey Affair and Warwick University Ltd, reflecting the student unrest of the late 1960s and contributing to the intense national debate about the purpose of higher education. Other titles featured the radical and influential ideas about schooling propounded by writers and teachers from America and elsewhere. In November 1937, Penguin inaugurated a new series of short, polemical books under the rubric of Penguin Specials with the publication of Edgar Mowrer's Germany Puts the Clock Back. Their purpose was to offer in-depth analysis of current affairs that would counter the perceived bias of the newspapers in addition to being the company's response to the popularity of Gollancz's Left Book Club. 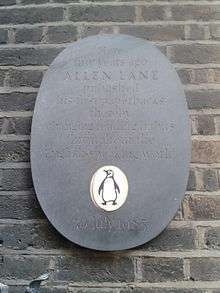 Whereas the Left Book Club was avowedly pro-Soviet, Penguin and Lane expressed no political preference as their editorial policy, though the widespread belief was that the series was left-leaning since the editor was the communist John Lehmann and its authors were, with a few exceptions, men of the left. Speed of publication and delivery (a turnaround of weeks rather than months) were essential to the topicality and therefore success of the Specials, Genevieve Tabouis's anti-appeasement tract Blackmail or War sold over 200,000 copies for example. However even this immediacy did not prevent them being overtaken by events: Shiela Grant Duff's Europe and the Czechs only made it onto the bookstands on the day of the Munich agreement, but nevertheless went on to be a bestseller. Thirty-five Penguin Specials were published before the outbreak of war, including two novels Hašek's Good Soldier Schweik and Bottome's The Mortal Storm; they collectively made a significant contribution to the public debate of the time, with many of the more controversial titles being the subject of leading articles in the press. After a hiatus between 1945 and 1949, the Penguin Specials continued after the war under the editorship of first Tom Maschler, then after 1961 Tony Godwin. The first title in the revived series was William Gallacher's The Case for Communism. Godwin initiated the "What's Wrong with Britain" series of Specials in the run up to the 1964 election, which constituted a platform for the New Left's brand of cultural analysis that characterised the leftist political radicalism of the 1960s. Indeed, Penguin Books contributed to the funds that set up Richard Hoggart and Stuart Hall's Centre for Contemporary Cultural Studies at Birmingham University in 1964. This brief period of revival for Penguin Specials in contributing to the national dialogue was not sustained after the departure of Godwin in 1967, and with the rise in television journalism the Specials series declined in significance through the 1970s and 1980s. The last Special was published in 1988 with Keith Thompson's Under Siege: Racism and Violence in Britain Today. In July 2009, another 50 Popular Penguins were released onto the Australian and New Zealand markets. A further 10 titles written by New Zealand authors were released in March 2010. Another 75 titles were released in Australia in July 2010 to mark Penguin's 75th anniversary. Allen Lane approached Nikolaus Pevsner in 1945 for a series of illustrated books that would match the success of the King Penguins. Pevsner recalled his response: "Allen said, 'You have done the King Penguins now and we are going on with them, but if you had your way, what else would you do?' I had my answer ready—and the answer was very formidable, because I outlined both The Pelican History of Art and The Buildings of England on the spot, each about 40 to 50 volumes. Allen said, 'Yes, we can do both,' and that was the end of the meeting." Pevsner's industry quickly bore fruit with the first contracts signed by 1946 for John Summerson's Architecture in Britain, Anthony Blunt's Art and Architecture in France, and Rudolph Wittkower's Italian art and architecture, the first title Painting in Britain, 1530-1790 by Ellis Waterhouse was issued in 1953. By 1955, Pevsner produced a prospectus for the series announcing the publication of four new volumes and a plan for the rest of the series totalling 47 titles. The ambition of the series exceeded previously published multi-volume histories of art such as André Michel's Histoire de l'art (17 vols, 1905–28), the Propyläen Kunstgeschichte (25 vols, 1923–35). Forty-one volumes were published by the time Pevsner retired from editing in 1977, his work was continued by his editorial assistant on the Buildings of England Judy Nairn and the medievalist Peter Lasko. 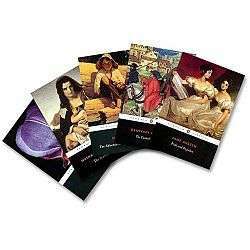 Yale University Press acquired the series in 1992 when 45 titles had been completed, they subsequently published 21 volumes, mostly revisions of existing editions. Mobile bookstore launched by Penguin Books India in collaboration with Ms. Satabdi Mishra and Mr. Akshaya Rautaray. ↑ "CEO Markus Dohle Announces Penguin Random House Global Leadership Team". Penguin Random House. 1 July 2013. Retrieved 1 July 2013. ↑ Allen's brothers Richard and John were co-founders and shareholders, though Allen was the dominant figure in the company. John died in service in 1942, Richard sold his share to Allen before the company went public in 1961. The Penguin Companion, pp.80-81, Penguin Collectors' Society, 2006. 1 2 "About Penguin - company history", Penguin Books. ↑ Florence Waters (26 August 2010). "Penguin's pioneering publisher – who never read books". Daily Telegraph. Retrieved 17 February 2014. ↑ "The launch of Penguin Books and the role of F. W. Woolworth". woolworthsmuseum.co.uk. 1 2 Wood, Dignified Flippancy, 1983, p. 23. ↑ Mary H. Munroe (2004). "Pearson Timeline". The Academic Publishing Industry: A Story of Merger and Acquisition. Archived from the original on October 2014 – via Northern Illinois University. ↑ Mcdowell, Edwin (1986-10-01). "PENGUIN AGREES TO BUY NEW AMERICAN LIBRARY". The New York Times. ISSN 0362-4331. Retrieved 2016-04-12. ↑ "The New York Times: Sunday February 1, 1948". timesmachine.nytimes.com. Retrieved 2016-04-12. ↑ "A Million Penguins Go To Sleep". Thepenguinblog.typepad.com. 2007-03-07. Retrieved 2010-12-04. ↑ "The Penguin Hotline - Penguin Books USA". www.penguin.com. Retrieved 2015-12-13. ↑ Caldwell, Christopher (2003-03-07). "Why English books are crummy. - Slate Magazine". Slate.com. Retrieved 2010-12-04. ↑ Paul Laity. "Pelican books take flight again". the Guardian. ↑ "List of Penguin Specials". Booksandwriters.co.uk. ↑ Alison Flood. "Penguin joins push for short ebooks". the Guardian. ↑ Roy Greenslade. "Penguin and The Economist form partnership". the Guardian. ↑ Anna Baddeley. "Ebooks round-up". the Guardian. ↑ Anna Baddeley. "Short but sweet e-reads for winter". the Guardian. 1 2 Baines, Puffin by Design, 2010, p. 147. ↑ "Popular Penguins". Popular Penguins. Retrieved 2010-12-04. ↑ booktagger (2008-11-18). "Booktagger.com". Blog.booktagger.com. Retrieved 2010-12-04. ↑ "Penguin Books New Zealand". Penguin.co.nz. Retrieved 2010-12-04. ↑ "New Zealand Popular Penguins" (PDF). Retrieved 2010-12-04. ↑ "List of 75 Popular Penguin titles for July 2010 release". Popularpenguins.com.au. Retrieved 2010-12-04. ↑ Edwards, Russell; Hall, David J (1988). So Much Admired - Die Insel-Bucherei and the King Penguin Series. Edinburgh: Salvia Books. p. not cited. ↑ McGonigal, Jim. "King Penguins - Nov 1939". The Design. Jim McGonigal. Retrieved 2 January 2013. ↑ "Clipping of Tribune India - The Tribune". epaper.tribuneindia.com. Retrieved 2016-05-22.